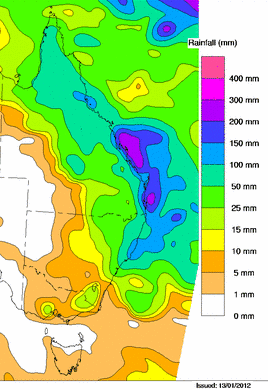 Areas of coastal south-east Queensland could receive up to 100-200mm of rain over the next 8 days according to computer forecast models of rainfall from the 14th to 21st January 2012. 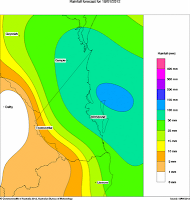 Whilst official forecasts for today (Saturday 14th) indicates cloudy periods with a little light rain developing today, the computer models predict less than 5-10mm will fall today and Sunday on the Gold Coast and south-east coast. Additionally storm activity for today is likely to be mostly inland and is unlikely to reach the coasts. On the up side, temperatures have return to their milder counterparts with daily maximums back in the mid-high 20's. This was after the high temperatures earlier this week of 32-35 degrees - which caused fears of fires with a very-high fire danger on Wednesday 11th January, along with extreme power usage that had some residents (or newspapers) fearing of widespread power outages speculating the Gold Coast's entire power supply would fail. Needless to say the latter appears to be just 'sensationalist reporting' - I haven't found any reports of widespread power outages caused by the heatwave on the coast. We'll keep you posted of any forecast changes as they happen. Or better yet - visit us on Facebook and like us even more!